A Curl Curl local moved to the beaches and found Divine Flow through an existing member. James is an active outdoor sportsman and a gym regular and came to yoga to balance out the yang in his life. 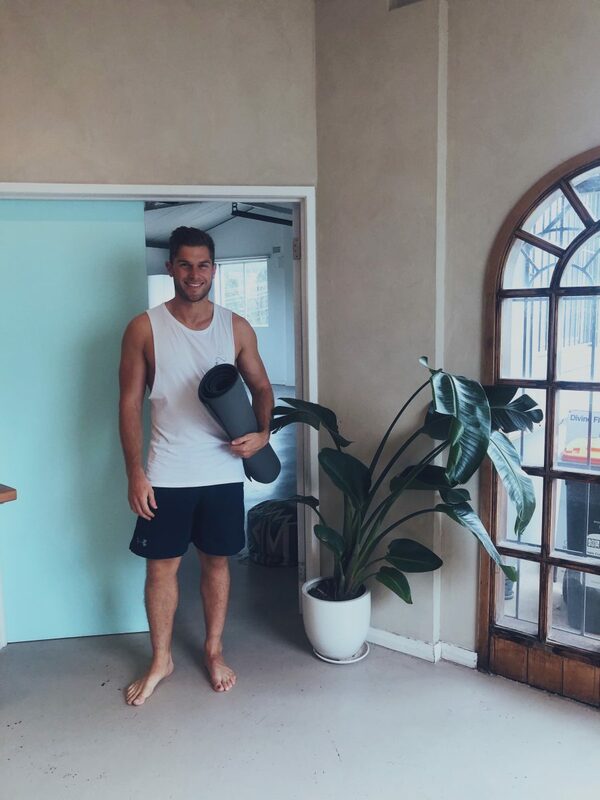 Being a local practising Chiropractor James can see and notice the major benefits yoga has on the body and how slowing down helps maintain and improve his physical activities. James is particularly drawn to Yin or Restorative as he knows that slowing down his body and taking time to pause within stillness and breath is exactly what he needs. How long have you been a chiropractor for? I have been practicing chiropractic for 5 years now and I have worked in a number of different clinics across Sydney. Currently, I am practicing in North Curl Curl at Impulse Chiropractic. I first tried yoga a couple of years ago at a gym but only went sporadically. I started practicing yoga at Divine Flow over a year ago when a friend suggested that I try out the studio. Since then I have been practicing consistently 2-3 times a week! I mostly practice the yin and restorative styles of yoga to help with my mobility. I play a lot of sport and train at the gym regularly, so I find these styles of practice really good for my recovery and to add some balance to the week. I also find these styles great for managing stress. Life can get pretty busy sometimes and it always feels great when you can give yourself an hour just to stop and breathe for a moment. All the teachers at Divine Flow are unique and bring different qualities to the studio, which is part of the reason DF is so great! When the teachers include their own personal touch and interpretation of the practice, the classes become really special. I think being able to create an atmosphere that promotes peace, clarity, calmness and relaxation is very important. I think there are many different reasons people should do yoga. This is part of the reason why yoga is so great. Over the last year I have learnt that yoga is much more than just the physical aspect. It is much more than just “exercise”. Yoga offers many psychological and spiritual benefits as well. Divine Flow is a lovely community to be a part of and they offer many different opportunities for social interaction. Do you see the benefits of what yoga offers within the body from a Chiropractic perspective? I refer a lot of my patients to try yoga. Whether it is to help with someone’s pain or to help relieve stress. Yin and restorative styles of yoga I see as great options for patients who have issues with joint mobility or muscle stiffness. Stress can be a vital component in several chronic pain conditions and these two styles can be really helpful at managing that aspect. Vinyasa and hatha I find are great for helping patients improve joint and core stability as well as enhancing balance and muscle activation. Many of the postures and poses help to improve mobility and dynamic stability. Correct breathing patterns are undervalued in general, but it can be a very important factor when considering mobility and stability issues of the musculoskeletal system. All styles of yoga has a strong emphasis on correct breathing patterns. If you’re interested in starting yoga join our next Beginner Program. Find out more here.